'Swimming with Men' hits theaters this weekend and Charlotte Riley who stars in the film, attended the premiere this evening(July 4th) in London at the Curzon Mayfair. 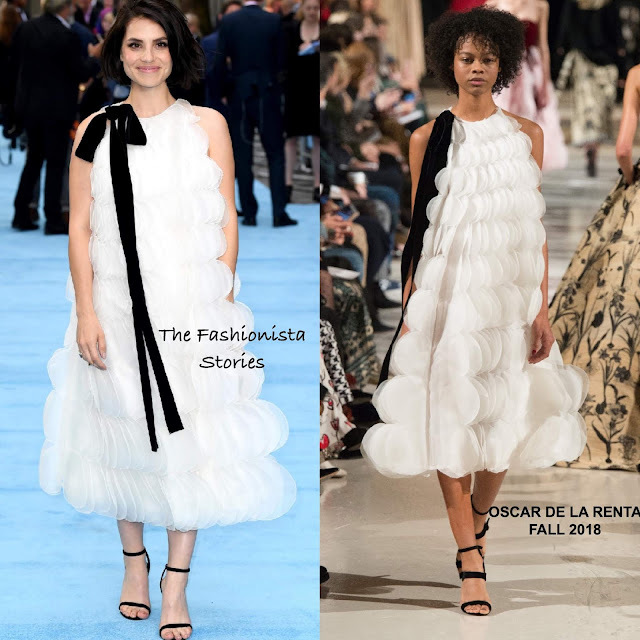 She posed on the light blue carpet wearing a OSCAR DE LA RENTA FALL 2018 white halter, calf length organza circle dress with a contrasting black tie-neck. On the beauty end, she kept things simply with minimal make-up & a side parted medium cut which topped off her look along with JESSICA MCCORMACK rings and JIMMY CHOO sandals.